Reliability Matters is a podcast on the subject of reliability of circuit assemblies. Reliability "best practices" and success stories are discussed. This podcast features interviews with experts in the electronic assembly industry. All electronic production segments which effect product reliability are on the table. This includes contamination, coating, cleanliness assessment, inspection, building for harsh environments and more. An interview with US Ambassadors of FLITE (Female Leaders in Tech Everywhere), Michelle Ogihara and Sherry Steep on the subject of women in electronics and FLITE’s mission to build a platform based on real-life experiences to help raise the visibility of females in technology. On this episode, we’re hosting a roundtable discussion on the subject of cleaning circuit assemblies after reflow. After all, contamination removal is exclusively performed to increase the reliability of circuit assemblies and the products they are installed in. I’ve known Phil Zarrow and Jim Hall for many years. Phil, Jim, and what they describe as their brothers, operate ITM Consulting, a consulting and advisory firm for the electronic assembly located in Springfield, TN. Phil and Jim also produce a question and answer program, answering technical assembly-related questions in an equally valuable and humorous manner. As you will hear, Phil and Jim, while taking their customer’s problems seriously, don’t take themselves too seriously, which is one of the things I love about them. Collins Aerospace’s Doug Pauls chaired the IPC committee to implement a new cleanliness testing specification. IPC J-STD001-G Amendment 1 which is now active. Doug explains the new requirements of this standard and provides suggestions on how to comply. Dr. Craig Hillman speaks about designing for reliability. Electronics for space and automotive applications are discussed. Several contamination-related failure mechanisms are presented including electro-chemical migration (dendritic growth, parasitic leakage) and conductive anodic filament (CAF). Methods to determine how clean is clean enough are discussed. Changing a customer’s mindset is often difficult. When a process is working well, we often resist changing the process, even if the change provides a better result. This is the “Good is the Enemy of Great” syndrome. My guest, Wendy Casker of Johns Hopkins Applied Physics Laboratory tells of us how she introduced a “better process” to her space customer. What happens when failure happens? This episode features Failure Analysis Investigators Eric Camden and Paco Solis. Together, they discuss stories from the field and some “interesting investigations”. This episode of Reliability Matters features an interview with SMT guru, Bob Willis. 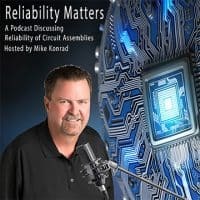 Reliability Matters is a podcast on the subject of reliability of circuit assemblies. Reliability “best practices” and success stories are discussed. This podcast features interviews with experts in the electronic assembly industry.